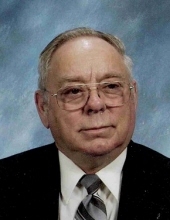 Virgil L. Daubendiek, 76, of Beatrice died at the Beatrice Good Samaritan Center on Saturday morning, January 12, 2019. He was born on March 15, 1942 in Beatrice to Ernest and Viola (Meints) Daubendiek. Virgil was baptized on April 5, 1942 and confirmed on March 25, 1956 at St. Paul’s Lutheran Church of DeWitt and attended Mount Hope Country School near Pickrell. He graduated from Beatrice High School in 1960 and served in the Nebraska Air Guard from 1960-1966. He married Joan Trauernicht in 1962 at Zion Lutheran Church of rural Pickrell and in their 56 years of marriage they lived in Lincoln, Pickrell, Minden, and Colorado Springs, CO. They were blessed with two daughters and two sons. After retirement they moved back to Beatrice in 2004. He was a member of St. John Lutheran Church and the Eagles Club both of Beatrice. Virgil enjoyed bowling, playing cards, watching old shows, Husker football, and fishing with his brother, Daryl. Survivors include his wife Joan Daubendiek of Beatrice; daughter, Teresa Daubendiek of Jacksonville, FL; sons, Keith Daubendiek of Jacksonville, FL and Kendall (Stephanie) Daubendiek of Colorado Springs, CO; six grandchildren, Samantha (James) Bose of Stamford, Jacob and Shawna Daubendiek of Jacksonville, FL, Jessica Daubendiek of Wichita, KS, Matthew and Joshua Daubendiek of Colorado Springs, CO; great-granddaughter, Skylar Bose; brother, Daryl (Diane) Daubendiek of Omaha; brother-in-law, Willard Trauernicht of Surprise, AZ; sisters-in-law, Verna Parde of Arlington, Linda Trauernicht of Lincoln, and Annora (Robert) Schmidt of Beatrice; many nieces, nephews, and friends. He was preceded in death by his daughter, Susan Daubendiek in 2015; his parents, Ernest and Viola; brother, Kenneth Daubendiek; parents-in-law, Willie and Reka Trauernicht; brothers-in-law, Dan Parde and Harlan Trauernicht; sister-in-law, Patricia Trauernicht. Cremation has taken place and a memorial service will be held at 10:30 A.M. Saturday, February 16, 2019 at St. John Lutheran Church of Beatrice with Pastor Leah Lawson officiating. Private inurnment of the cremains will be held at Evergreen Home Cemetery of Beatrice. A memorial has been established to the family’s choice with Harvey and Charlene Ideus in charge. A register book will be available for signatures at Fox Funeral Home on Friday, February 15 from 8:00 A.M. to 8:00 P.M. www.foxfuneralhome.net Fox Funeral Home of Beatrice in charge of the arrangements. To send flowers or a remembrance gift to the family of Virgil Daubendiek, please visit our Tribute Store. "Email Address" would like to share the life celebration of Virgil Daubendiek. Click on the "link" to go to share a favorite memory or leave a condolence message for the family.